Do you see the light at the end of the tunnel? 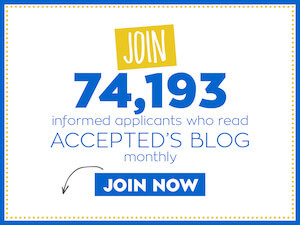 Your undergrad career is coming to an end, and it’s time to start applying to med schools. Having done your research, you know where you’d like to apply. But what are med schools looking for in an applicant? Yes, your grades are important. 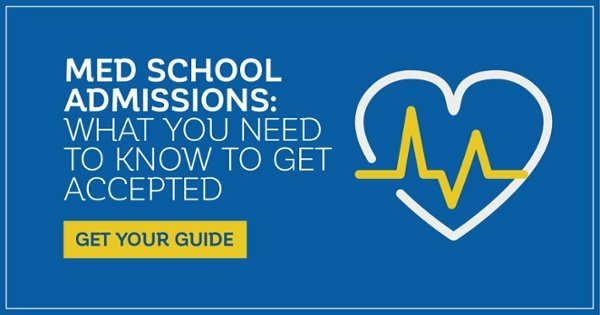 Along with your MCAT score, they often determine whether or not you’ll be offered a secondary application. The average GPA of students matriculating to med school in 2018 was 3.56 (overall) and 3.45 (science). They also look for a trend of improving grades over your undergrad career. It will speak better of you if your freshman year was a disaster, but you were able to overcome that and improve over the next three years, than if it were the other way around and you started school with a stellar track and then slacked off as time progressed. If your GPA is not in the 3.5+ range, take extra classes over the summer (and earn A’s), or consider a postbac program, rather than applying directly to med school. This is the second part of that magical duo (along with your GPA) referred to as your “stats.” The average MCAT score for students admitted to an MD program in the U.S. in 2017-2108 was 504.7. A stellar MCAT score is particularly important if your GPA is below 3.5. How do you get your MCAT up to this level? Practice, practice, practice! When premed students take the MCAT with no preparation “just to see how they will do,” it is usually a recipe for disaster. Imagine your doctor deciding to do surgery on you without preparing, just to see how they will do. Pretty awful image, right? The reason for all this craziness is medical schools want students who are willing to prepare. So, think like a surgeon and imagine you are taking someone’s life in your hands. Taking a prep course is a good first step, but you have to put in time outside of class as well. Set up a practice schedule for yourself that requires you to stay seated for at least two hours at a time, and gradually work your way up to longer stretches. The MCAT is a long test – 7.5 hours – and it’s hard. Train for it the way you would train for a marathon, by gradually increasing your endurance. Even if you do well on the practice test, continue to practice. There are many factors that can affect you on exam day, including nerves, fatigue, or simply a new environment. Knowing that you’ve practiced and prepared can help reduce these effects. Last but not least, prepare for the CARS (Critical Analysis and Reasoning) section. This tests your reasoning ability – an important part of medicine. Small liberal arts colleges vs. big-name-U? Where do you go? The answer depends on you. Will you thrive in a large and vibrant campus, or do better with smaller classes and more student-teacher interaction? Where are you more likely to get good grades and make connections with professors? Where will you feel supported and happy? A depressed student rarely does well in school. The best major is one that you will enjoy AND do well in. These two often go hand in hand since we like to study things we’re better at. Med schools accept people from all majors if they do well in their coursework, on their MCAT, and have a convincing story for the “Why medicine?” question. If you’re an econ major and all of your extracurricular activities revolve around business, it may be hard to justify your decision. However, if you had good clinical experiences, did research that you enjoyed and was meaningful to you, and participated in regular community outreach, then you are a strong candidate. Doing well in two fields of study makes you a stronger applicant and adds to the diversity and character of the med school. Schools often look for people with different backgrounds and perspectives. So, if you have a passion for a non-science major and think you can do the required premed coursework and do well on your MCAT, that is often a winning decision. A minor is not acknowledged by med schools. Rather than taking a minor that may end up bringing your GPA down, use your electives to broaden your knowledge and discover new passions. While you don’t want to appear to be coasting through your senior year, an elective in film, music, or women’s studies may be good for both your GPA and your cultural awareness. Shadowing as a premed is a good first step into the world of clinical experience, but it’s not enough to make you a strong candidate. It is passive and doesn’t help you develop any new skills. Shadowing may be a good way for you to decide what areas of medicine interest you, but then you need to look for a more active role through clinical experience. Just talking about the cool surgeries you observed is not going to make you stand out. Medical assisting, scribing, and patient education are ways to get hands-on experience. Show a sense of commitment by staying in the position for a year or more. Adcoms look at length of an experience to get an idea of how dedicated you are. Two weeks in the summer won’t impress them. Sustained clinical exposure will also give you the ability to describe patient encounters in your essays and interviews. This will make you a more interesting and convincing candidate. This is considered a must-have by many medical schools, and for good reason. They want applicants who tend to put others’ welfare ahead of their own. Doctors give up a lot of personal time for the benefit of others. Take a look at your experiences so far. Have you been a selfless giver of your time? If not, what’s stopping you? You may feel too busy or too tired, but these are not good excuses. Med students, interns, and doctors are always busy and often tired, but they continue to push themselves. If this is what you want, you need to push yourself as well. You may not know where to start. Ask yourself what you care most about in the world, what your passion is, what you value. Then find a volunteer activity that helps you fulfill these areas. It doesn’t have to be related to medicine, but it does have to involve those in need. In other words, tutoring a student in an upscale private school is not the same as tutoring a student in an inner-city school. And just like your clinical experience, it will have a stronger impact if you stay with it for a year or more. Doing research teaches doctors how to interpret results and look for errors in study design, which you will be doing a lot of in your future medical practice. Do you love lab research? If so, you may be able to get your name on a paper or poster and a great letter of rec from your lab chair. If research isn’t your thing, this may be difficult for you. That doesn’t mean that you can ignore this part of your application. Look around to see what kinds of projects are out there. Not all research takes place in a lab. The strongest research experience you can get is by doing an independent research project in an area that you find fascinating. Premed students do research on public health outcomes, hospital wait times, clinical therapies, and IT. Find a professor you like and ask to be assigned to a project. Most importantly, do research that sparks your curiosity and that you will enjoy writing about in your app and talking about in your interview. If you have to work during college, you will have to be even more organized and on top of things to get all of the components of your app together. However, your work can benefit you in the application process. If possible, find a position that gives you skills such as leadership or interpersonal communication, two very important qualities for physicians to possess. Describe the skills you gained while working. It takes a great deal of time management to work at a job, keep your GPA up, and prepare for med school at the same time. Physicians juggle their responsibilities all the time – be sure you describe your experience clearly. This is an important skill that’s often overlooked by applicants. As a physician, you will be leading a team of health professionals and guiding patients through difficult choices and options. You can start now by gaining the skills you will need to persuade, guide, and lead. You don’t have to be president of an organization to lead others. Some lead through teaching, coaching, or motivating others. Use your clinical experience, community volunteering, research, and paid work to hone your leadership skills. Say yes to leadership roles. Like anything else, practice makes perfect. These areas can show your strengths, including dedication, perseverance, a strong work ethic, and leadership, and can be used to get involved in the community, by coaching, teaching, or fundraising. Be sure to emphasize that while you get great personal satisfaction from participation in these activities, your passion is in using them as vehicles to help the community and to grow as a person. So if you’re a fifth-generation canoe-builder, an amateur birder, or a biointensive gardener, be sure to show how you’ve used this interest as a gateway to serving others, and your hobby will come across as supporting the complex person you are, not just as a fun activity. These programs generally fall into two categories: semester abroad or volunteer experience in a developing nation. Either one will afford you valuable lessons, just by immersing yourself in another culture. A semester abroad will give you college credits and the chance to take interesting courses. Volunteering in a developing country will give you hands-on clinical experience. If you love travel, can afford it, and feel that these experiences will give you valuable insights, go for it! But don’t worry if you can’t. The greatest thing that many applicants take away from their travel experiences is that they become more acutely aware of the similarities of all people, no matter where they’re from. You can develop this same awareness just by leaving your comfort zone, but not going so far from home. Look for rural and inner-city clinics in the U.S. to get the same, maybe even stronger, experiences. You can also get a great letter of recommendation from a mentor who works in this setting and is impressed with your dedication and leadership skills. These can make or break your application. Start finding mentors early in your undergrad career, and put in some time with them. Be there for their office hours, ask to be their research assistant, volunteer for overtime, or just help when needed. Just because you get an “A” in their class doesn’t mean that a faculty member will write you an outstanding letter. Show them your dedication, compassion, and sense of purpose, and your letter writer will probably find a way to mention it. It’s not enough to just tell them how badly you want to go to med school. You need to show them what it means to you. If you have a hard time convincing your mentor, you’ll never convince an adcom. Remember that the number of letters you get isn’t nearly as important as the quality of those letters. Eight generic letters will be meaningless, while three strong letters will go a long way. This can be the hardest thing to show in your med school app, and is possibly the most crucial. You want the adcom to see you as a person, rather than a set of numbers. Many applicants write their essays with a distant, almost dispassionate voice as if they are summarizing their resume for Wikipedia. Your personal statement shows who you are. You need to write it with emotion and passion. A properly written personal statement can be one of the best ways to get into medical school. It lets the adcom see beyond your stats, to the living, breathing future physician that you are. A perfectly crafted personal statement can put your application on the top of the accepted pile. This advice goes for your interviews as well. This is your chance to tell the adcoms what sets you apart from the pack, and why they need you in their program. To prepare for the writing demands of the medical school application process, it’s a good idea to start journaling early in your college years. You don’t have to use any of this material in your application, but your essay will be more genuine if you have practiced ahead of time. If it still feels foreign to you, try reading a memoir of a doctor you admire. Some of my favorites are Damon Tweedy’s Black Man in a White Coat, Atul Gawande’s Complications, and Kathy Magliato’s Memoir of a Female Heart Surgeon. 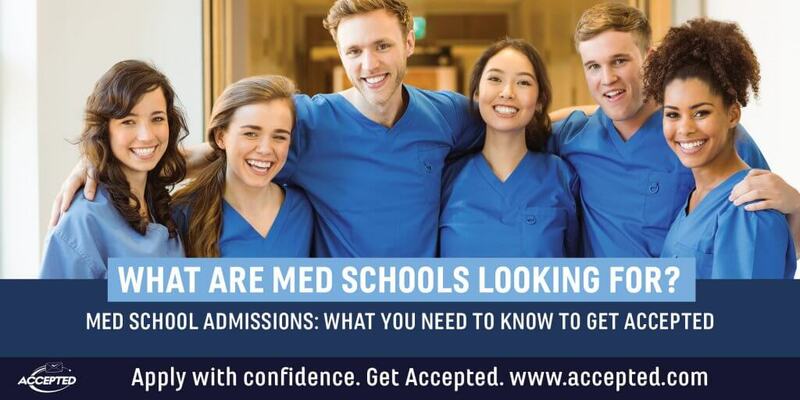 There are so many ways to stand out with your med school application. Chances are that you won’t be exceptional in all areas, so be sure to highlight those where you are, and downplay those where you aren’t. Med schools know that you’re human. They’re just looking for the most extraordinary humans for their program. Now that you know what med schools are looking for, it’s time to get to work on those applications! Explore Accepted’s Admissions Consulting Services to learn how our expert advisors can help you create an application that highlights these 13 areas of qualification, grab the attention of the admissions committee, and get ACCEPTED.